October 18, 2003, the American Armsport Association, Frank & Karen Bean, met with the representatives from United States Armsports, Dave Devoto, Leonard Harkless, and Denise Wattles. An all day meeting transpired in Las Vegas, Nevada with the hopes of finding a way for the two armwrestling groups to work together should the AAA’s unification proposal be accepted by both World Federations. The American Armsport Association and United States Armsports agreed to work together under one World Federation. Neither organization will “join” the other nor lose their identity. For over 30 years, the AAA has held a National Championship event each year and, once the World Armwrestling Federation was established by Bob O’Leary in 1976, the AAA has sent athletes to participate in World Championship events, starting with the very first event, based upon their placement at the AAA Nationals. Five years ago, United States Armsports was formed and sent a team to a World Championship event held by Mr. Fred Roy in Canada. Since then, both groups have participated at World Championships events but, under two separate World Federations. 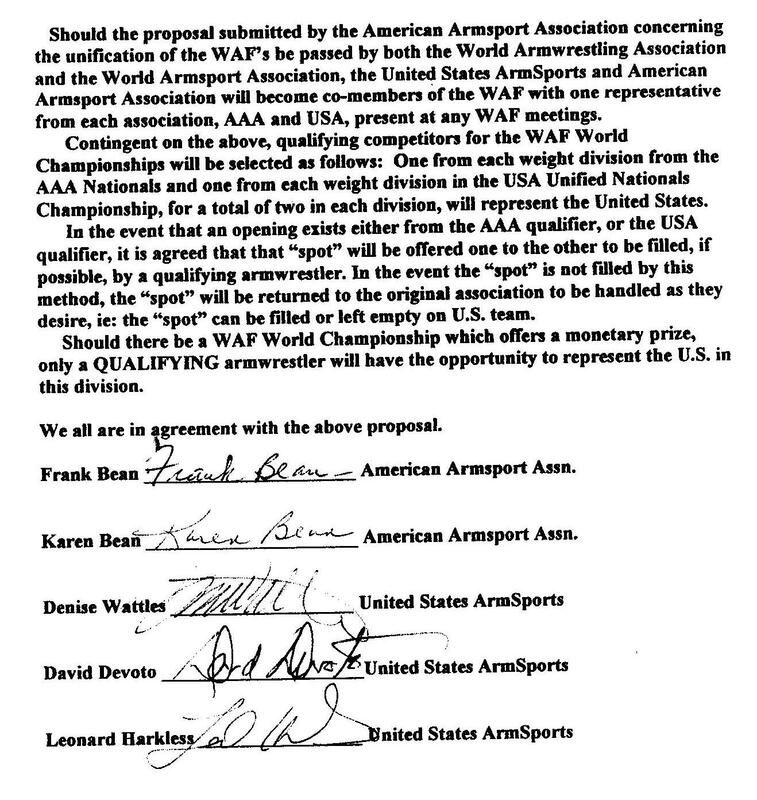 With the possibility of the two World Federations coming together as one, the AAA and USA needed to find a mutually agreeable solution to their continued participation but neither organization wanted to “join” the other nor lose their identity. The AAA and USA have mutually agreed to continue with separate operation, but work together with both organizations coming together for the World Championships each year. Below you will find the signed working agreement between the AAA and USA. Note, as has transpired over the past 5 years, all athletes may go to either one or both events to attempt to represent their country at the World Championships. Both groups will work together to fill the United States team. As both World Federations allow for two representatives to attend Congress meetings, both AAA and USA will have one representative each in the annual meetings. The United States will continue, as mandated by both World Federations Constitutions, to have only one vote, as do all member nations. The AAA Executives, Frank & Karen Bean, look forward to the working relationship with the United States Armsports representatives. The United States is no different than the World in that the foundation is laid and there’s nowhere to go but up.